Set in the enchanting area of Vaimaanga on the stunning southern coast, Palm Grove enjoys the tranquility of one of the best locations on Rarotonga. 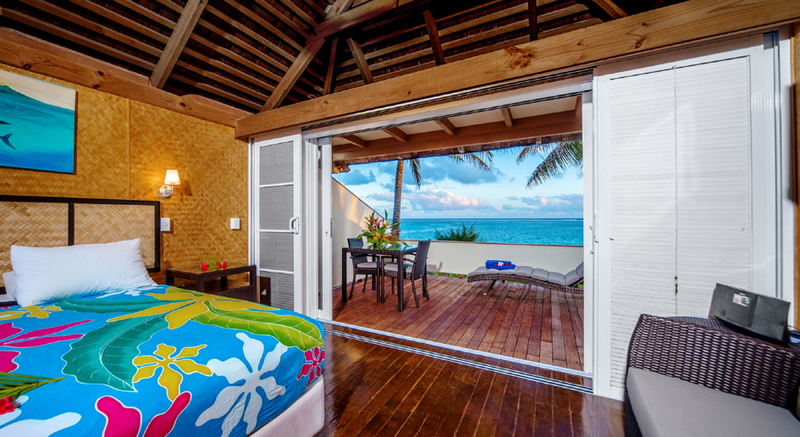 We offer 22 individual bungalows scattered over 5 acres of landscaped beachfront and garden property. Our spectacular white sand beach overlooks our gorgeous lagoon, and our garden area has wonderful views of the lush mountainous interior of the island. Palm Grove offers bungalows in studio to three-bedroom layout, in beachfront and garden settings. All bungalows are free standing with full kitchen facilities, premium superking beds, airconditioned bedrooms, flatscreen TV, ceiling fan, and private balcony/patio. Our prices offer some of the best mid-range accommodation on the island. Palm Grove’s onsite restaurant, The Yellow Hibiscus, is located in a garden area. Open seven days a week for breakfast, lunch, and dinner, all guests receive our complimentary tropical breakfast buffet daily. We also offer live music three nights a week, our very generous Friday night Happy Hour function (FREE drinks! ), and our popular Sunday BBQ evening. The calm, protected lagoon on the southern coast of Rarotonga offers excellent swimming, snorkeling, and kayaking for guests of all ages and abilities. Palm Grove has complimentary snorkel equipment and kayaks, as well as beach chairs and beach towels. In our garden area is our fresh water swimming pool with attached children’s paddle pool, as well as our guest BBQ area. Our Reception desk will gladly arrange any island tours or excursions for you, and we are happy to make recommendations for things to do during your stay. Rarotonga has a wide variety of activities on offer and some excellent dining options both for daytime and evening. Whether you’re coming to relax or keep busy – or a little bit of both – we’ve got you covered! Considering getting married on Rarotonga? Palm Grove has a range of wedding packages to choose from and our garden restaurant can cater for receptions of up to 35 people. Children of all ages at permitted at Palm Grove at any time of the year, in select room categories.